Have you heard of the ‘Mosquito Deterrent’? It’s a device that broadcasts an ‘extremely annoying’ and ‘highly irritating’ high frequency sound, usually around 17kHz, that only younger more sensitive ears can hear. It’s said to deter young people from staying in some public places – and prevent the presence of ‘anti social behaviour from vandals and drug users’. I quote one of the companies that make them. http://movingsoundtech.com/ It unfortunately doesn’t just target the ‘vandals and drug users’ as stated, it targets all young people, and consequently it seems infers that all young people are ‘criminals’. In answer to the unpleasant Mosquito Deterrent I’m in the process of making a sound installation that is hopefully pleasant to hear and is solely for young people- being in a high frequency that only younger people can hear. (Older people can’t usually hear these frequencies because their ears naturally loose sensitivity to higher frequencies.) For older people who can’t hear the sounds – this will be a bit like a sound art version of The Emperors New Clothes! 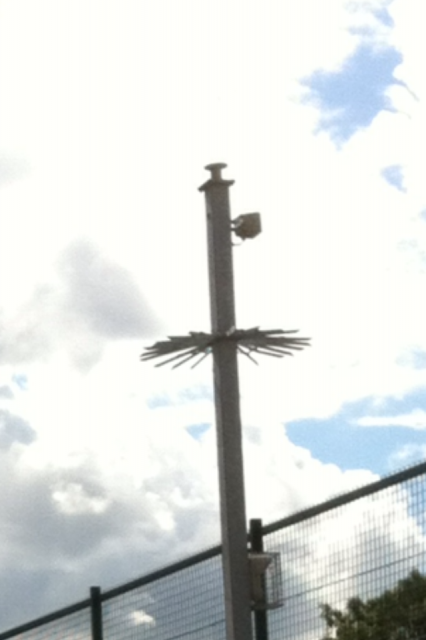 Mosquito Deterrent outside a local school. Although the device claims to be ‘harmless’, David McAlpine, who is the director of the UCL Ear Institute and Professor of Auditory Neuroscience and who’s research looks at different causes of hearing loss, said it is ‘damaging children’s hearing’. (Keynote address Supersonix Conference 2012). https://iris.ucl.ac.uk/research/personal?upi=DMCAL14 As a gesture towards those discriminated against, I thought I’d make a sound work that only young ears could hear – that there was a choice to hear or not – and that aimed to be pleasant rather than unpleasant: a Mosquito ANTI Deterrent. Is there such a thing as a pleasant high frequency sound? Here is a screen shot of the CPD soft ware that made the sounds. The black shows lower frequencies being cut so the sounds are shifted higher and higher. Find out when your ears loose sensitivity by listening to the track with a timer. If for instance, you can’t hear anything after 24 seconds – find 24s on the graph (on the horizontal) and you will see it corresponds to 14kHz (on the vertical). I wanted to see how these different recordings (below) behaved when their pitch was shifted up. To be inclusive they are first in an adult audible range of around 9kHz. •	Can you tell which are sparrows, which are repeated chords and which are bike wheels? •	Which do you prefer – or do they all give you a headache? Here are the same recordings shifted up around the 17kHz range. •	Can you hear them? Which do you prefer? •	Do they all give you a headache? Sound artist Bim Williams introduced me to different soft ware: Pro Tools, Ableton Live and Melodyne, to listen to their pitch shifting capabilities – and they varied considerably. To create a questionnaire for purely likes and dislikes for these sounds- although subjective – could be straight forward, given controlled circumstances, but more interestingly our perceptions of sound depend not only on the mechanisms of the ear but the use of our imaginations. 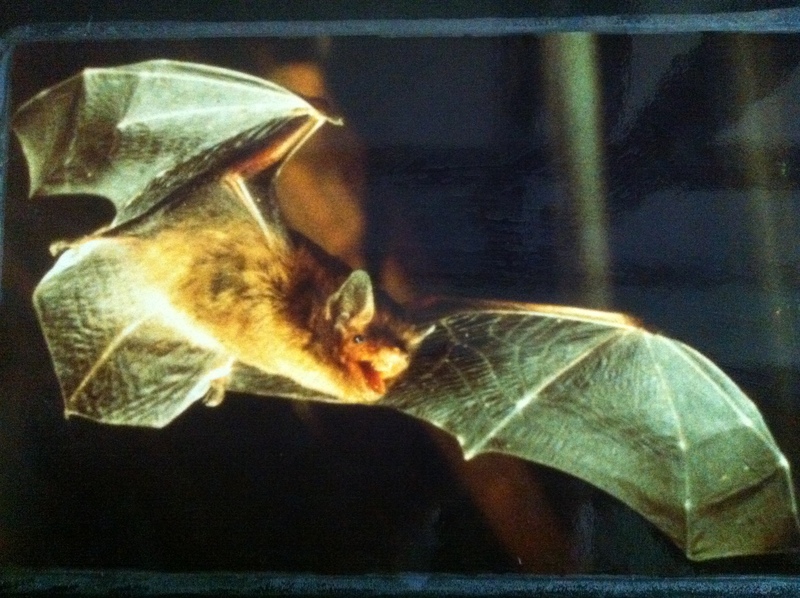 I went to listen and record some fruit bats in the Cotswold Wildlife Park. http://www.cotswoldwildlifepark.co.uk/ . Here are some audible beeps from them. Our hearing being generally around 12kHz and higher for young people under 25. Ear tests at the clinic are often at around 8kHz (McAlpine 2012). These high and low frequencies – out of our range of hearing are audible worlds we can only imagine, and I can only guess with my ears what the Mosquito Deterrent sound is like. that there are a multitude of other worlds to imagine that can be heard – if not by our ears then by others. I may or may not find sound that is pleasant for young ears to hear in a Mosquito ANTI Deterrent at all, but I’m now definitely interested in the worlds of sound I can only imagine and how our imagination comes in to play.